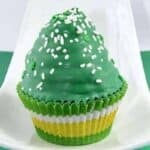 Green Velvet St. Patrick’s Dipped Cupcakes, fun white and green dipped cupcakes. 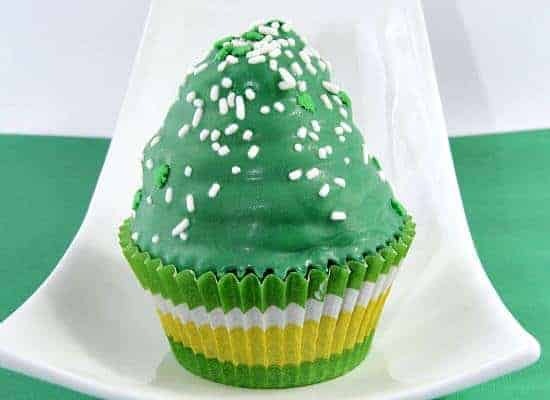 Green Velvet St. Patrick’s Dipped Cupcakes recipe, an easy homemade cupcake recipe with cream cheese frosting for St. Patrick’s Day! I lived in the south for awhile and one of the first things I learned was how much people in the south LOVE their Red Velvet Cakes! Hard not to fall in love with a slightly chocolate cake with fluffy cream cheese frosting! 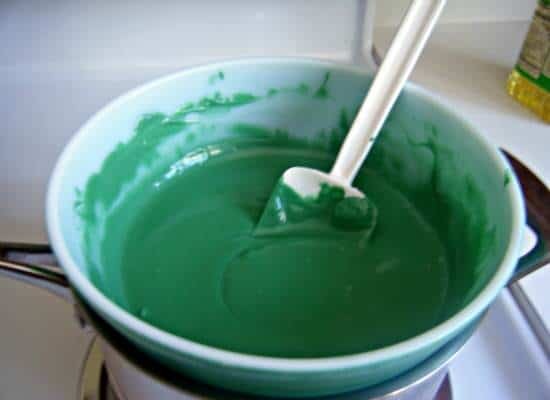 But it’s St. Patrick’s Day, so Red Velvet wasn’t going to work, but GREEN Velvet would work. Ok, I’ll admit, I’m not Irish. Not even a little. Not Southern either. But I have a lot of Irish and Southern friends so that’s got to count for something, right? 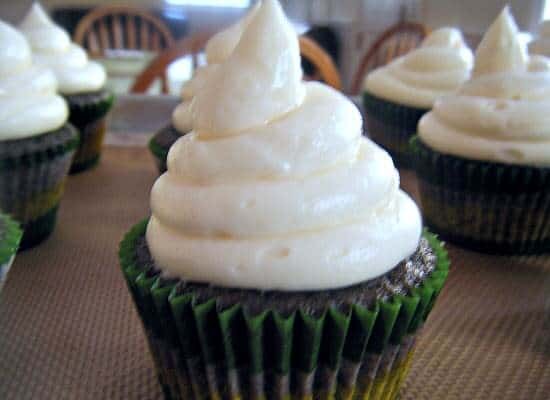 And this cupcake is for them and everyone else who wants to be a little Irish and/or Southern this St. Patrick’s Day. Oh, one more thing….Did I mention that after I piled the cream cheese frosting onto these cupcakes, I dipped them in green candy melts? Yeah, I know….they’re a little over the top, but St. Patrick’s Day only happens once a year, right? 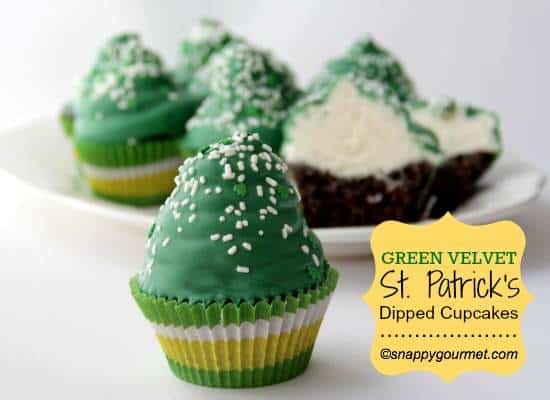 May the luck of the Irish be with you all, and may your day be filled with these Green Velvet St. Patrick’s Dipped Cupcakes! If you want to get more Snappy Gourmet recipes, you can sign up to get posts/recipes by EMAIL or RSS FEED. Follow me on FACEBOOK or TWITTER. You can use your favorite Red Velvet cake or cupcake recipe. I looked a few recipes and combined them all. But to start you need to mix the dry ingredients all together. I used Hershey’s unsweetened cocoa powder and you may have to vary how much you add depending on how green you want your cake batter. I’d prefer the chocolate flavor over the green color so I added 3 tablespoons of cocoa powder. When the cake batter is ready spoon it into cupcake liners. I like to use an ice cream scoop so that the cupcakes come out about the same size. Also a lot easier and cleaner than using a spoon! After the cupcakes have cooked and cooled, make the frosting. Use a good quality cream cheese such as Philadephia so that the frosting is firm enough to dip. Place the frosting into a pastry bag or plastic bag (with a corner cut) and pipe onto cupcakes. 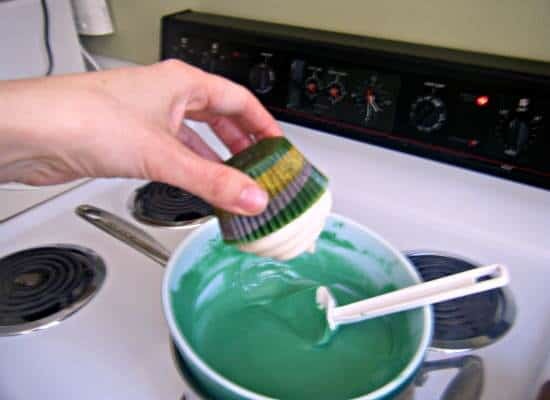 After you place the cupcakes in the refrigerator for the frosting to set, melt the candy melts according to the package directions either in the microwave or double boiler. Use a narrow deep bowl or container if possible to make it easier to dip the cupcakes. When you’re ready to start dipping the cupcakes, turn one of the cupcakes upside-down just to test that the frosting is firm. This is the time that you may want to say a prayer or two. :) Then start dipping. Let the coating drip off the tip for a few seconds otherwise when you flip the cupcake back the right way the coating won’t drip down the cupcake liner. 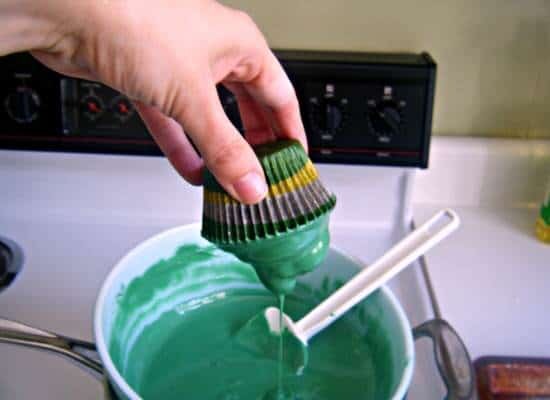 If you want to decorate the cupcakes you can use some cute Wilton St. Patrick’s Day sprinkles. Be sure to spoon the sprinkles on top of the cupcakes before the coating sets. Then place the cupcakes back in the refrigerator for the coating to set. Try to only take a few cupcakes out of the refrigetator at a time while dipping so that the frosting stays firm on the cupcakes that haven’t been dipped yet. You’ll probably have some candy melt leftover. You can pour it onto a piece of waxed paper, place it in the refrigerator to firm, then cut or break into pieces and store in a sealable bag so you can use it again sometime. The coating on the outside of the cupcakes only takes a little while to get firm, then you can serve. These cupcakes are tempting so start passing them out quick! Fun cupcakes that are a twist on the classic red velvet. Preheat oven to 350 degrees F. Line cupcake pans with 24 paper liners. 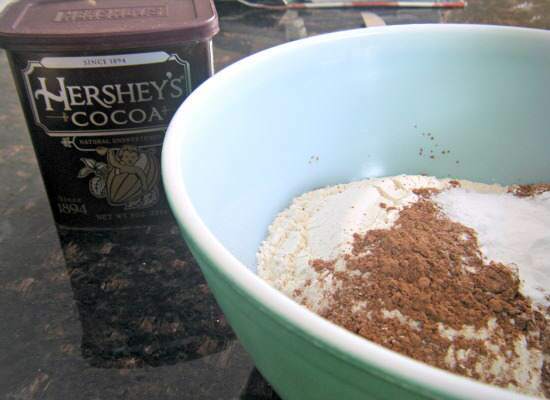 In a small bowl whisk together flour, cocoa powder, baking soda, and salt until well combined; set aside. In a large mixing bowl, beat together 1/2 cup butter and granulated sugar until creamy. Beat in eggs and vanilla. Alternate adding buttermilk and flour mixture into butter/sugar a little at a time while beating. 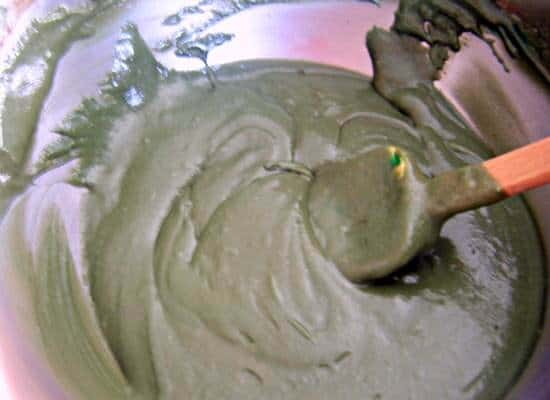 Add a few drops of green food coloring at a time, mixing after each addition until desired shade is reached. 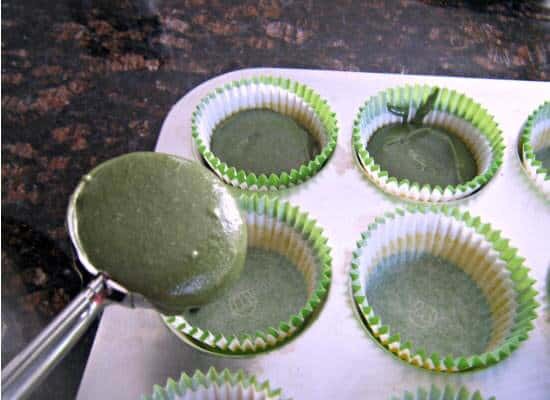 Spoon batter into lined cupcake pan. Bake for about 15-20 minutes or until toothpick inserted comes out clean. Cool completely. To make frosting beat together cream cheese and 1/2 cup butter until well combined. Beat in vanilla, then beat in powdered sugar. 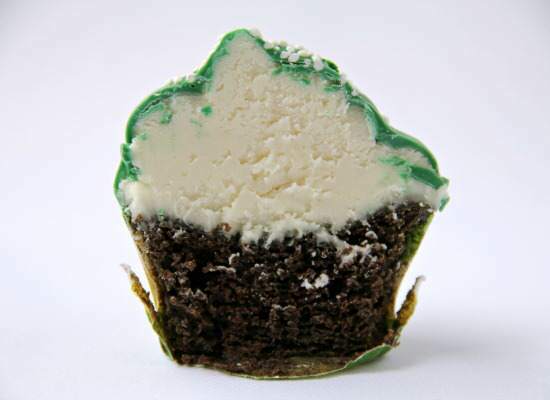 Place frosting in a pastry bag (or large resealable bag with corner cut) with a large tip and pipe frosting onto cupcakes. Place cupcakes in refrigerator for at least 1 hour or until frosting is set. 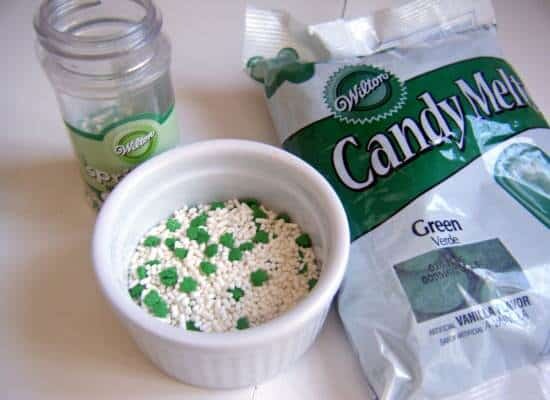 Follow directions on candy melts package to melt in microwave or double boiler. Dip cupcakes into melted candy, let the extra candy drip off, then turn upright, spoon sprinkles on top, then place cupcakes back in the refrigerator. Work with just a few cupcakes at a time, while leaving the rest in the refrigerator, so that frosting remains cold and firm. Refrigerate about 5-10 minutes or until topping is firm or until ready to serve. SNAPPY TIPS: If you want a cake batter that is more green, only use 1-2 tablespoons of cocoa powder for a lighter colored batter. For the frosting, make sure you use good quality butter and cream cheese so that the frosting is firm enough when you flip the cupcakes over to dip. SNAPPY SUBSTITUTIONS: Any colored candy melts including white, would work well with these cupcakes. 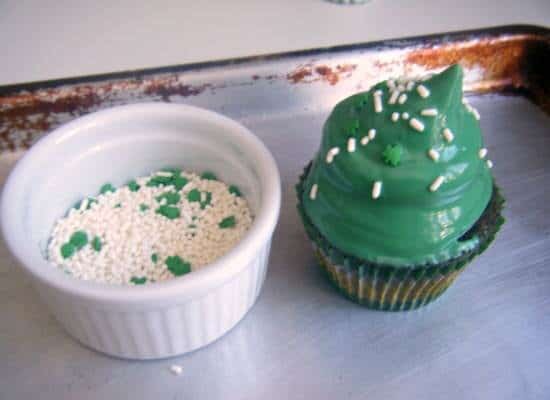 If you can’t find St. Patrick’s Day sprinkles use any green or white sprinkles or omit. Thanks so much Dawn! Look forward to checking otu all the pins this week! Can I make these a few days ahead of time and keep them in the fridge??? Hi Marcia! Yes, they should be ok in the fridge for a few days. I am making these for my girlfriend get-together in March. They look amazing!! I hope I can make them look as good as you did!!! These is absolutely amazing idea to change red into green velvet! I’m delighted with your cupcakes! I’ve featured this recipes on my blog! I hope you don’t mind! If you don’t agree with that please contact me and I will remove it. All the best. Will a butter cream or shortening icing work for the dipping? If so, can you suggest a recipe? and would it have to be refrigerated before dipping also? Thanks for any suggestions. My family don’t care for the cream cheese icing and they don’t like the marshmallow frosting either, strange, I know, but that’s my family. Did you really need 2 bags of candy melts? I am going to buy mercken’s which is about 16 oz, would that be enough? Tash, if the cupcakes are in air conditioning they should be fine. However, if it’s warm or they’re outside,I don’t think they would hold up very well. Most frosting/chocolate is going to melt if it’s warm regardless. As far as the amount of chocolate…it really depends on how high you pipe the frosting. If you don’t do too much frosting one bag would probably be enough, however the higher you pipe the more chocolate you’re going to need. It’s also MUCH easier to dip the cupcakes if you have a lot of melted chocolate. I would suggest buying an extra bag JUST in case. You may be able to return it or it will last a very long time. You can also pour the leftover melted chocolate out and let it harden then save as I did in the post. Hope that helps! Awesome blog! I am so making these for a cake order i have coming up but in red! Because they will be sitting out on a table for presentation, possibly for a few hours, would you know if they will be likely to melt? It will be summer however it will be at night and they will be inside hopefully with a good air-con running!